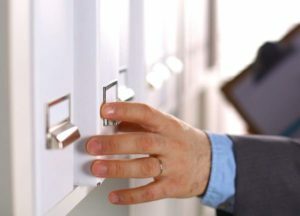 Looking for offsite document storage for your company? Captech Logistics can provide you with high level climate controlled storage services to help you meet all of your file retention requirements. As about your special discounted rate for file storage. Document retention requirements can vary by industry and location. For example, the IRS recommends businesses keep tax return records for three to seven years, or ,in some cases, indefinitely. The EEOC has requirements regarding the length of time companies keep employment records and the Department of Labor’s Fair Labor Standards Act (FLSA) sets requirements for payroll record storage. In 2002 the Sarbanes-Oxley Act was signed into law. Section 802 of this act sets requirements for record storage periods for items such as audit files and imposes strict penalties for destroying these files. Captech has a dedicated, high level secured document storage space for Sarbanes-Oxley compliant companies.